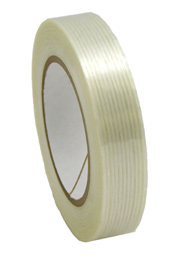 High-strength, filament reinforced tape for closing non-typical box styles, such as Design Style Trays, Full Overlap Boxes, Five Panel Folders, Full Telescoping Cartons, Etc. Also used to close Heavy-Duty Style RSC's and for bundling boxes together to save on freight costs. Excellent durability and adhesion. Filament Tape- Anchor 788, 1/2" x 60 Yds.